Code complexity aside, which of the follow two options is preferred for displaying html ordered lists? This is really a matter of opinion. 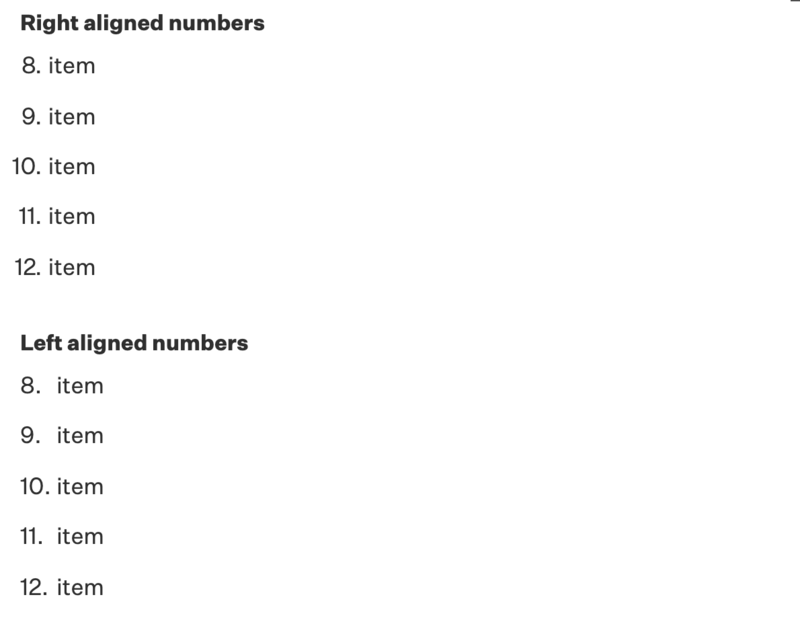 I prefer right aligned numbers, then inset, left aligned text to the right of the numbers. I also prefer my numbered list to not have periods or parentheses at all. That is unless at least one of the list item text also starts with a number - then I'll use a close parenthesis to separate the bullet from the content. Again, this is my preference. The primary factor with lists is to always remain consistent with their styling across a piece or brand. You don't want to format one list a certain way, then format another list a different way. So use a format which will work universally for all lists needed. When there are doubts in graphic design the best it's going to the contrast. 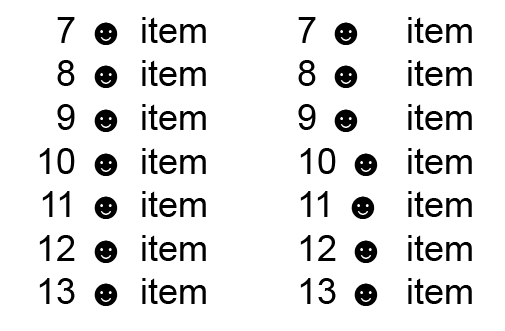 Decision: adding a differentiating character to separate items by numbers. Problem: how this character interacts graphically. When we are incorporating a numerical list to our design it's to favor the ease of reading. If to favor this reading we add a series of numbers plus a new character, this discordant element should be kept as far as possible from being a new irregular noise in reading. Not the answer you're looking for? Browse other questions tagged print-design website-design text lists or ask your own question. Best practice when implementing numbered lists in columns? Have a Design Concept — How to iterate it into multiple breakpoints for Developers? 2 column text frame different text in each column?